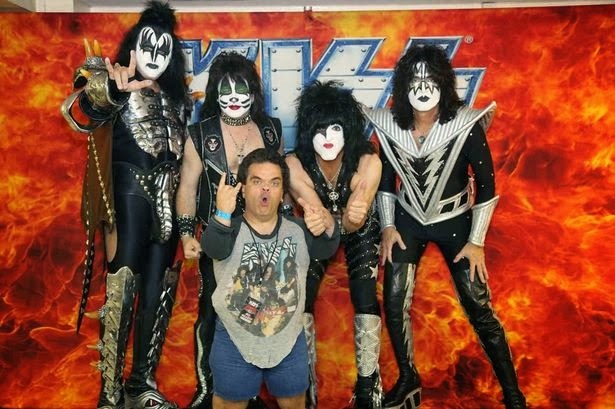 A Kiss fan has spent £25,000 on the band’s merchandise and following his favourite band all over the world – and admits his obsession has cost him a few girlfriends. But devotee Dan Griffiths, who is a dwarf, said the band “who look like freaks” helped him come to terms with who he is. Having battled with negative feelings about his height, Dan from Aberystwyth credits the American rock band with giving him confidence during his teens. Now aged 45, Dan, who has been to 48 of the band’s gigs, and met his heroes on numerous occasions, has a tattoo which covers his entire back with the faces of each band member, and the Kiss logo complete with lightning bolt in the middle. “I have tried to get their autographs tattooed as well but, even signed with permanent marker, they have never lasted long enough for me to have a tattoo session,” he said. Dan first saw Kiss perform when he was just 12. It was to spark a lifelong obsession. “It was on Top of The Pops in May 1979,” he said. In the programme Dan Bach a Kiss on S4C next Thursday, Dan reveals what it’s like to be a faithful member of the “Kiss Army” as the band release a new album and embark on a new world tour. “A fan enjoys the music, follows the band and goes to their gigs. But a fanatic takes it a little more seriously. I would put myself in the ‘major fanatic’ category. With an entire room dedicated to storing his priceless collection of band memorabilia, it is simple things like drumstick given to him the band’s late by drummer Eric Carr, and a towel thrown into the crowd that he values most. In total, Dan estimates he has spent at least £25,000 on band memorabilia and gigs. But there is a serious note to his relationship with the band. “How many dwarves are there in the world – around 1 in 50,000 people? I’m a freak and I’m unique. “When I was a teenager and the kids around me were growing taller, from 4ft up to 6ft, the same thing wasn’t happening to me. There was one dream he was yet to fulfil: to see Kiss play in Tokyo, and re-live one of their most famous gigs when they rocked the Budokan Hall in 1977. With the announcement of a new world tour, the dream moves a step closer, and the S4C programme follows Dan to Japan, past the security guards, to the backstage area where he comes face to face with his heroes.